Sometimes you have to laugh at the things that go wrong when new rvers hit the road - but some you recognize, even if laughing now, could have been catastrophic. We learned the hard way about tires that have dry rot. Oh...it is painful reliving this story...but we will summarize the best we can. From October, 2009 to March, 2010, our trailer went from Glacier National Park, Montana to Illinois. Then it went to North Carolina and eventually made its way to Myrtle Beach. No problems with those little rubber circles whatsoever. It was when we were leaving Myrtle Beach and heading back to see family in Illinois when things, literally, fell apart...all in a matter of days! Now, we poke fun at ourselves but you need to know that during all of this roadside assistance, not once did our tires ever get blamed for our problems. Even the experts didn't notice the dry rot on the tires. We were under the apparent delusion that you can always see tire rot, which we found out wasn't true...the hard way. If you don't know our history, we can briefly summarize that we became rvers without any preparation, knowing nothing about motorhomes or travel trailers. We actually hit the road not even knowing how to work the toilet, empty the water tanks, etc. You can imagine, with a smile/smirk, our "inspecting" our camper, prior to purchase, would be just about the same as our looking over a 747, deciding if it was sound....yes, "pretty" was key. It all looked nice, must work fine! Heh, heh. Our Award Classic travel trailer, shown in the photo, actually was a wonderful first home, except for one small problem - the tires looked beautiful (this was, indeed, a problem). Certainly we "tested" them by putting on our glasses, squatting down, and deciding they had really nice tread, were very clean (no mud! wow!) and, when we gave 'em a swift kick with our shoe, our foot bounced back off, just like the response one would expect from excellent quality rubber tires. Yep...pretty, bouncy, shiny...perfect! Let's roll! But They Looked So Pretty and Shiny!! RV Air Compressor, RV Wheel and Tire Protectors And More Tire TLC - Be Prepared!! 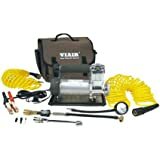 400p-rv Automatic Portable Air Compressor Kit. Our first problem happened on the highway in Georgia. Honestly, we didn't notice a thing (double axles are your friend, believe us!). A trucker was honking and waving at us...at first we thought people were just amazingly friendly in Georgia...but the look on his face said "pull over or you are going to die!" So we did. We discovered an exploded tire...not even duct tape could have helped it. We waited forever for a tow truck. The gentleman put our spare on and said the tire blew because we needed our bearings repacked, and proceeded to jiggle the tire to prove his point. So we drove to the nearest campground and made an appointment with Goodyear for the following morning. AS THIS PHOTO SHOWS, THIS WHOLE SCENARIO MADE ME QUITE CRAZY!! AND THIS PHOTO WAS TAKEN A YEAR AFTERWARDS!! Goodyear repacked all of our bearings, INSPECTED our tires and said they were "fine" and sent us on our way. We did purchase a new tire there, not wanting to drive on the older spare tire. Nice unexpected expense, but we were sure our troubles were over...until we got to Nashville, of course. Yes...they have friendly truckers in Nashville...on the highway, he was honking and waving, too! This time, we could see sparks flying from the troubled tire, and we knew this wasn't good. Long story short (and an entire day spent at the mechanics...a little place in the middle of absolute nowhere), the bearings were packed poorly and one destroyed our hub. Now we're getting worried. Our emergency fund was wearing down. The nice owner of the shop said if WE drive to Nashville to pick up the hub, it will save us tons on the final bill. So off we went. Hours later, we had hub in hand, it was installed, and we rejoiced. Before leaving, he also "inspected" our tires and said "they look great...you'll be fine." So we hit the road. That evening, in the dark, somewhere near Marion, Illinois, we heard that "flop, flop, flop" on the highway. By this time, we were seriously unstable emotionally. As luck would have it, the next exit had a campground (cannot tell you how lucky this was). So we drove on the bad tire, hazard lights on, just happy to be able to sleep. I think we would have slept on the highway if we had to. This time, it was the same axle but opposite tire that blew. Yes...we called the tow truck again, they put the spare on, and we drove 45 mph for our final 200 miles on the backroads, until we reached our destination. The final outcome? Both tow truck experts were wrong. Goodyear was wrong (and did pack the bearings poorly and refunded our money, for destroying the hub) and the nice, backwoods mechanic was wrong...these tires were full of dry rot!! We had to buy all new tires...and when our travel trailer had new rubber, the mechanic showed us something...there is a "DOT" code on the tires, that tells when the tires were made (usually on the inside sidewall). It was determined Custer used these on a wagon on the day of his last stand...they were THAT old. Moral of the story? Tires that sit for long periods of time can develop tire dry rot, invisible to even the most observant of observers. That does not excuse the fact that those we encountered should have had the common sense to check the date...but they didn't. So our travel trailer got "new shoes" and we learned a hard, valuable lesson! 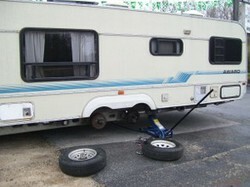 Now we know to be better prepared and how to care for our rv tires...and what to look for. We have only been rv fulltimers for two years....and a lot is learn by doing. We now recognize that a pretty tire might not have been used much, so it looks really nice on the outside, but it will disintegrate after it hits the highway. Stay safe and Happy Trails! Do You Have RV Tips For Beginners Or "Exciting" Dry Rot Stories?? 5 flats! Wow...so glad you are okay. That is the scariest part...thinking of the dangers of losing tires on the highway. Thanks for your comment and happy trails! Been fulltiming for a 18mo now. Our first voyage got us to AL on dry rotted tires and the next trip was to FL, we had 5 flats in 36 hours! I have future plans to have some adventures myself so thanks for writing about yours! Helpful lessons are welcome! I love how you're turning all your RV experience and adventures into articles. These are most helpful for new RVers. And those of us who wish to vicariously be RVers through your articles enjoy them too. I'm glad you stayed safe through all that drama! I came across a serious rv accident last summer that happened when their tire popped. Not pretty. Thanks for the tips you share, and keep safe on the road. A great story on your first adventures. What a learning curve you had ahead of you, right! Thanks for sharing. I feel like I get to taste a little of the rv'ing life through your writing.